Huge jugs and spectacular climbing bypass an intimidating roof on the excellent first pitch. Higher on the route is a slab pitch, a contrived roof to face with loose blocks, and an extremely loose face with huge, dangerously loose blocks. 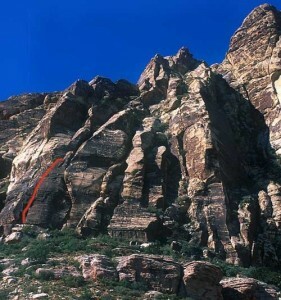 We strongly recommend rappelling from the bolted belay at the top of the first pitch. This rap is directly down Mike’s Route, which is a great toprope or lead. Which SuperTopo guidebooks include a topo for Lazy Buttress?